In my last blog post I wrote about a new promising drug called dabrafenib, but some negatives about this drug included resistance and side effects. In order to address the issue of resistance, a drug that targets a different part of the MAPK signaling pathway called trametinib is used in drug combination therapy. In chemotherapy using just dabrafenib there was a response rate of 56% and in combination therapy there was a recorded response rate of 76%. Dabrafenib targets the BRAF protein while trametinib targets the MEK protein, which can be seen in Figure 1. 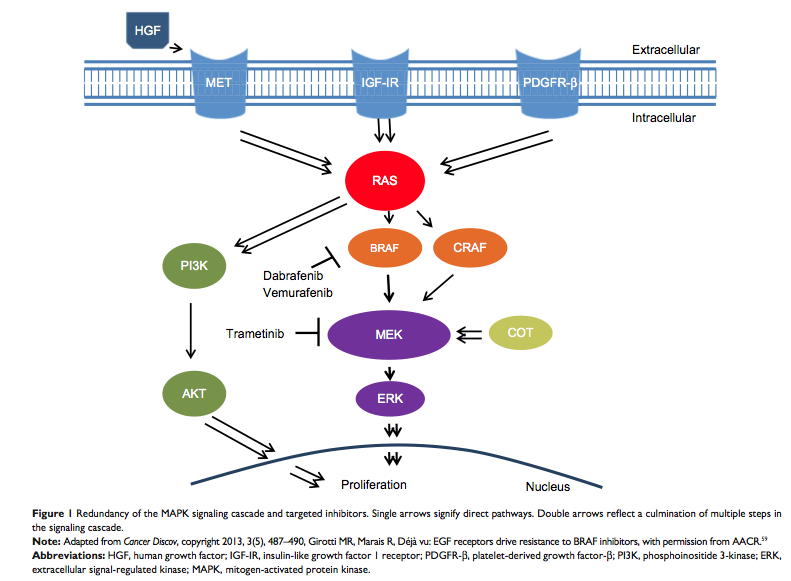 Figure 1: The MAPK signaling pathway shown with labels of where the different drugs discussed (Dabrafenib, Vemurafenib, and Trametinib) target. These drugs are toxic to the body at certain levels and have many negative side effects. Some side effects include pyrexia (fever), chills/rigors, nausea, and diarrhea. The most common side effect is pyrexia that is debilitating to the patient. Pyrexia was seen in 26% of patients that took only dabrafenib and in 71% of patients who took a combination therapy with dabrafenib and trametinib. 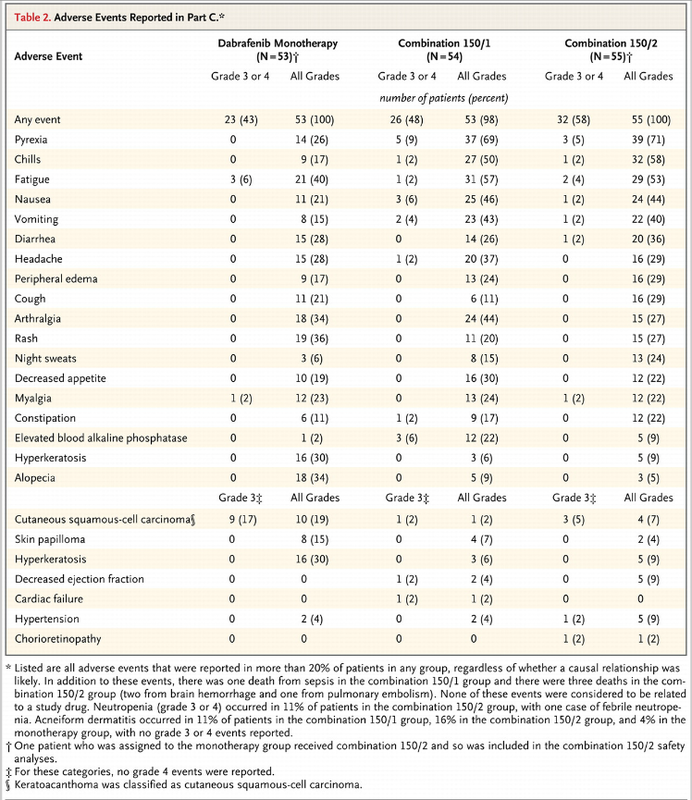 Table 1: A table showing the different side effects of Dabrafenib alone and Dabrafenib and Trametinib in combination therapy and the severity by grade of the side effects. The higher the grade the more severe the side effects are. Although pyrexia is common among patients taking this combination therapy for metastatic melanoma, the treatment options are limited. The side effects of the therapy are severe enough to halt treatment, therefore it is important to focus on treating these side effects. This is the view taken by authors Julian N Lindsay and Michael Barras in Sydney, Australia who wrote a report on the side effects of a 77 year Caucasian female and how her pyrexia can be treated with a low-cost and low-risk steroid called prednisolone. The patient entered a hospital in Sydney with complaints of rigors/chills, confusion, and nausea. When she was admitted to the hospital she had a temperature of 104.18°F. She had BRAF V600E mutation-positive metastatic melanoma, paroxysmal atrial fibrillation, hypertension, diet controlled type 2 diabetes mellitus and dyslipidaemia. Her medications included 150mg dabrafenib twice a day, 2mg trametinib, digoxin 62.5 micrograms daily, telmisartan 40mg daily, rosuvastatub 40mg daily, omeprazole 20mg daily, and 1g paracetamol six hourly. The patient was tested for any sign of infection and none were found, which means that the pyrexia was most likely due to the combination drug therapy of dabrafenib and trametinib. She was treated with cefepime 2g eight hourly and within about 4 hours of admittance, the patient’s temperature had dropped to 98.24° F and her nausea had stopped, but her rigors/chills continued;the physician withheld the trametinib and dabrafenib. On day 2 dabrafenib and trametinib were restarted with an additional 10mg of prednisolone a day to treat the pyrexia. The patient was monitored in the hospital for the next 3 days with no further negative side effects on 10mg of prednisolone a day. She was then called upon for the next 8 weeks once a week to check up and there weren’t any other episodes. This case report is an example of a low-cost, low-risk way of treating the side effects of drug combination therapy for metastatic melanoma that is not published. New oral-targeted drug therapies have higher incidences of adverse effects than the previously use chemotherapy drug dacarbazine which was given intravenously. Although dabrafenib has less side effects than the previously used MAPK targeted drug vemurafenib, 30% of patients out of 187 taking dabrafenib alone in phase 3 trials had to have interruptions in dose because of adverse effects and 15% of patients had pyrexia. When dabrafenib is combined with trametinib, 71% of 54 patients experienced pyrexia. The cause of the pyrexia from these drugs is unknown. The future of this combination of drugs is promising, but the issue of its debilitating side effects must be addressed if it is to become used at is maximum level. This article presents a positive solution to these side effects that should be published and more universally known. Flaherty, Keith T. et al. Combined BRAF and MEL Inhibition in Melanoma with BRAF V600 Mutations. New England Journal of Medicine. 2012. Kainthla, Radhika. et al. Dabrafenib for treatment of BRAF-mutant melanoma. Pharmacogenics and Personalized Medicine. 2014. Lindsay, Julian N. and Michael Barras. Facing the challenges of new melanoma-targeted therapies: Treatment of severe fevers associated with dabrafenib/trametinib combination therapy. Journal of Oncology Pharmacy Practice. 2014.